In the late 80s I was in love with the NES, it blew my Intellivision and Atari 800XL away; at the time it seemed like a machine that was capable of infinite power. 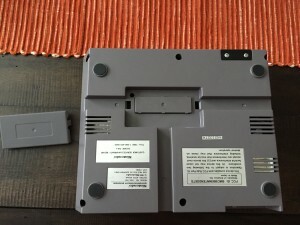 During that period there was one fateful night I examined the NES unit and noticed a small compartment at the bottom, upon removing the plastic guard I discovered it was an expansion port! My mind reeled with possibilities, what would Nintendo do with this amazing new interface we discovered? Fast forward to 2015. 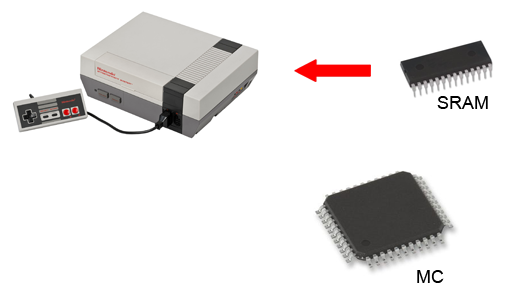 Nothing was ever officially done with the expansion port and it was removed in the later top loading revision of the NES. 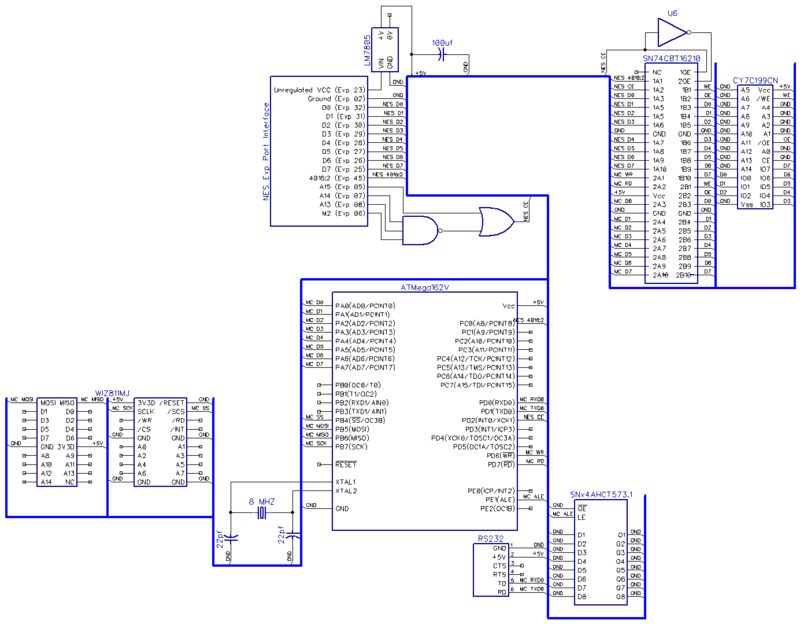 I only know of one unofficial project which attempted to use it; Chkyn’s ENIO EXP Board which allows the NES to communicate with devices and IP hosts, unfortunately it seems to have stalled awhile ago. 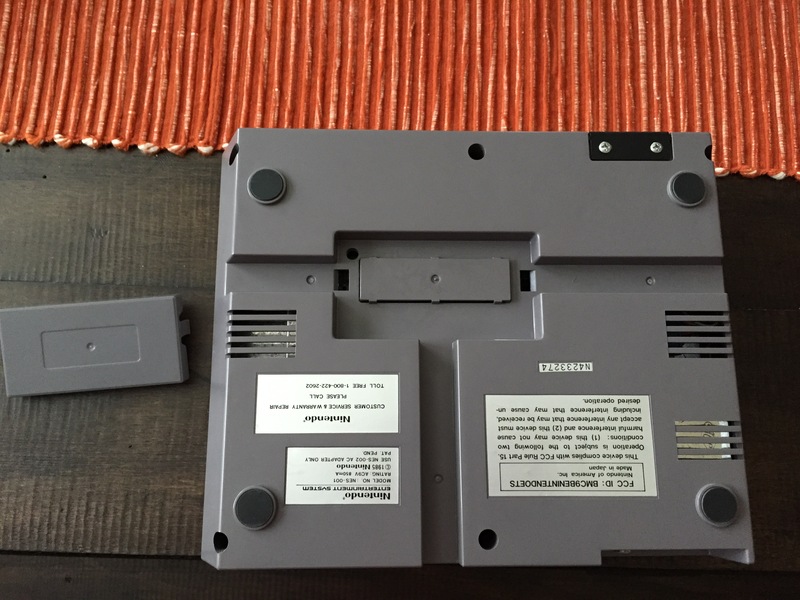 My NES Twitter project was to fulfill a childhood dream; to use the expansion port to enhance the NES in some awesome way. 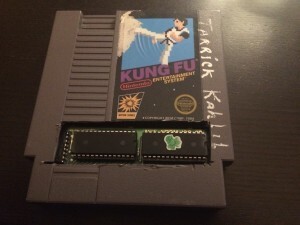 Internet connectivity is always fun, so I started down that path and decided to use the expansion port to allow the NES to communicate with the world by sending a Tweet through Twitter. So that’s where we are today. The rest of this article is the technical details of how it works. I’d like to preface with the disclaimer that I’m not a hardware engineer, there are many improvements which can be made; my primary goal was to finish a proof of concept. 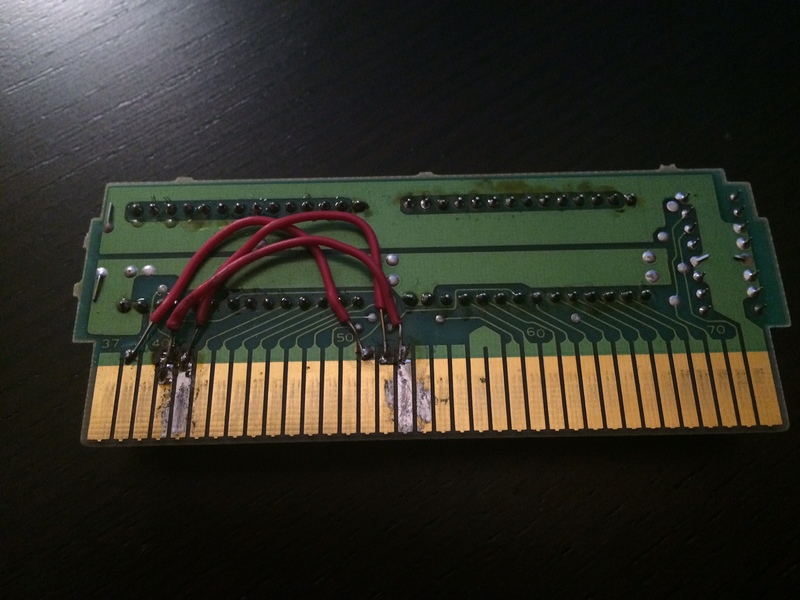 The NES expansion port exposes the NES’ data bus, some cartridge pass-through pins, and address line A15 (among many other things). I use the combination of these to write to an external piece of SRAM shared with a microcontroller (MC). As the SRAM is written to by the NES; the MC grabs it and processes it. I have the NES writing a simple message protocol which can be one of two messages. The first is an “Echo” where the MC will write back (I.e. “echo”) a value to the NES, and the second is a “Tweet” where the MC will relay a tweet from the NES to a server over TCP/IP. 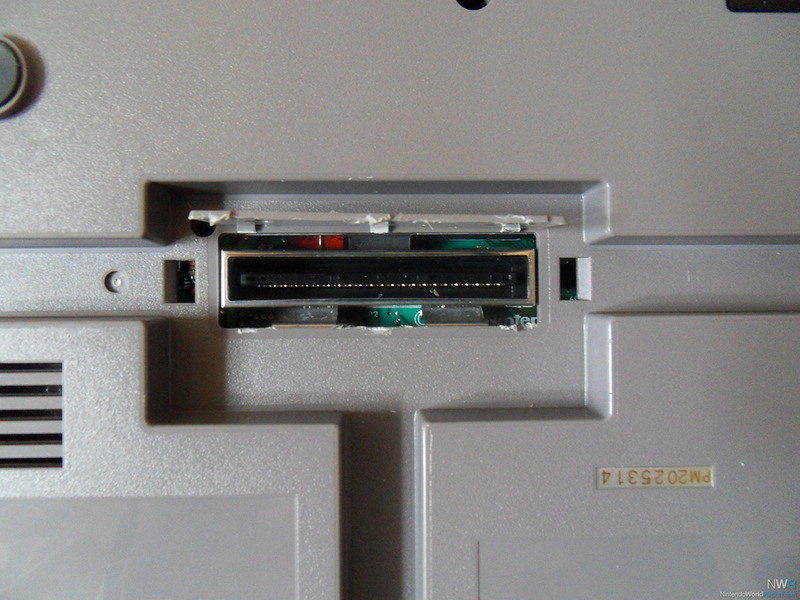 The NES data bus is exposed in the expansion port through pins 25-32 which I simply wired to SRAM pins D0-D7. I wired the SRAM address lines A0-A15 straight to ground which effectively means the NES will always read and write to SRAM address $00. 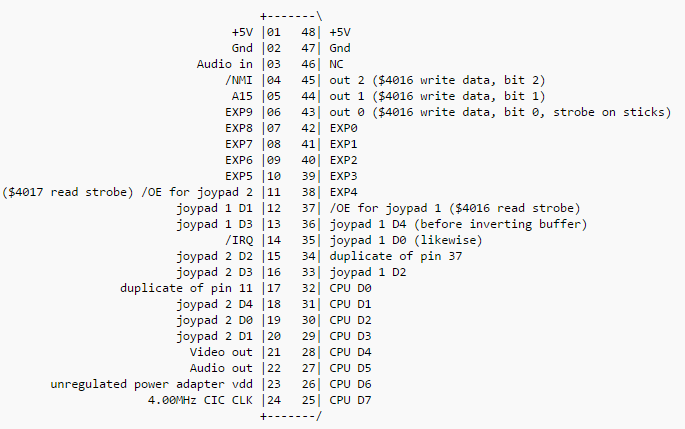 This is fine because after each byte is written the MC will grab it from the SRAM and vice versa. The SRAM is simply a temporary holding location for a single byte. Next I needed to set the SRAM to read or write mode depending on whether the NES was going to read from it or write to it. SRAM has a write enable pin, if this pin is pulled low (grounded) the SRAM can be written to, otherwise it’s being read from. 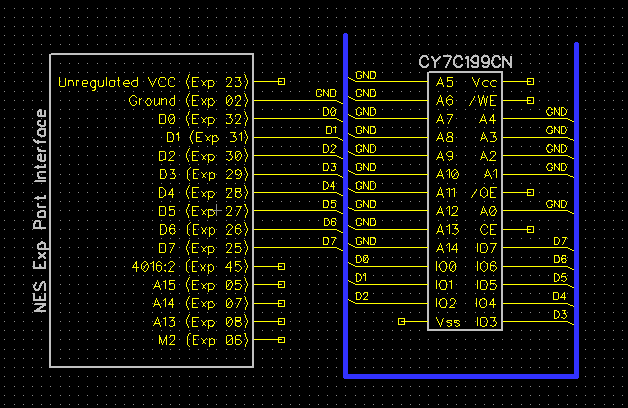 To toggle this I looked to pin 45 of the expansion port. The expansion port exposes 3 pins (43-45) which you can pull high or low through address $4016. 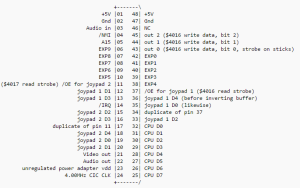 Normally $4016 is used to access the joypad, but it has the advantage that the low three bits are also used to toggle these three pins. 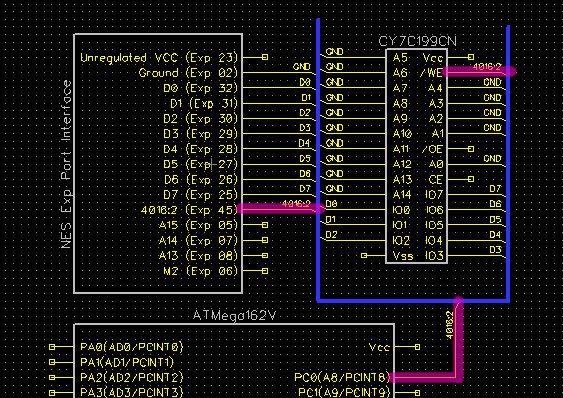 So I wired pin 45 to the write enable pin on SRAM. 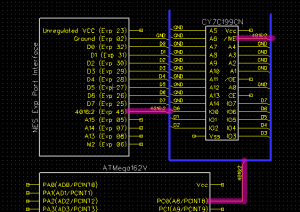 If I write $00 to $4016 that pulls the pin low, which sets SRAM to write mode; if I write $ff to $4016 it pulls the pin high which sets the SRAM to read mode. Additionally, I have also wired this to a pin on the MC. 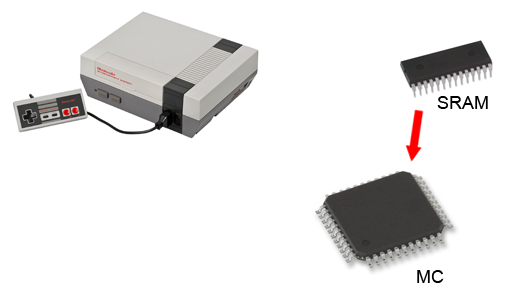 The MC queries this value to know if it needs to read a value the NES wrote or to write a new value for the NES to read. It’s worth mentioning that this does not interfere with the ability to read from the joypad. 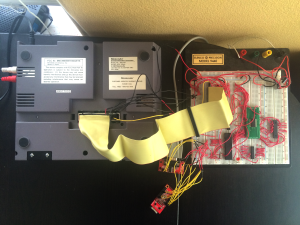 When $4016 is used to access the joypad you will not be doing SRAM reading or writing and vice versa. 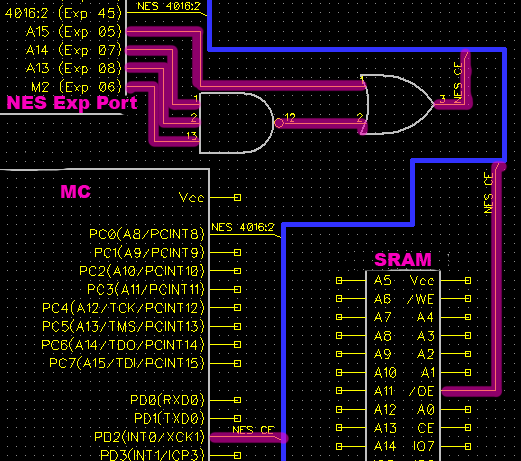 Finally, I needed to enable the SRAM when the NES wants to interface with it. The SRAM can’t be enabled all of the time or it will interfere with the NES data bus and cause corrupted game data. SRAM has a chip enable pin which, when pulled low, will enable the SRAM. So I needed to wire up a signal to pull it low at the key moments the NES needs to read or write from it. On a NES NROM cartridge board (Kung-Fu, Super Mario Bros, Baseball, etc. ), addresses up to $4002 are for tile data, registers, etc. ; while $8000 and above is used for code. $6000 is reserved for other purposes and maps to no where on these boards. This means I could leverage that address to trigger an SRAM enable anytime the NES wants to access it. 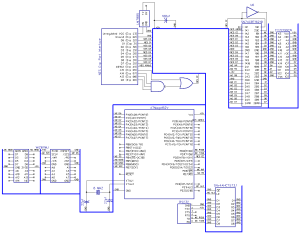 Effectively this means a write to $6000 will enable the SRAM which in turn means it’s active on the NES data bus and, depending on read or write mode, it will read a value from the data bus or a write a value to the data bus. So if A15 is low the NES is not accessing anything $8000 or above, which means it’s not accessing code. If A13 and A14 are high it’s not accessing anything below $6000 which means it’s not accessing tile data, registers, etc. 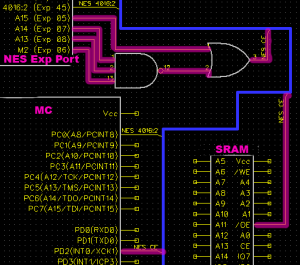 As I mentioned before $6000 maps to nowhere on the NES cartridge so I can use that combination (A15 low, A13 and A14 high) to activate the SRAM. One last item to note, the NES uses a modified 6502 chip. 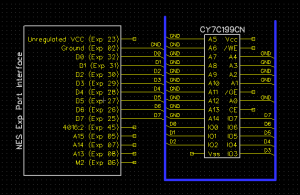 6502 has alternating phases (called M2) which go high and low with each clock cycle. The data bus is only stable when M2 is high which means I need to make sure M2 is high when I enable the SRAM or it might read garbage values from the data bus. This means M2 must also be sent to the expansion port. M2 is exposed on cartridge pin 38, so my dad soldered cartridge pin 38 to cartridge pin 53 which passes through to expansion port pin 8. Here is the final soldering job on the cartridge, thanks Dad! Finally, I had everything I needed exposed on the expansion port. I ran those 3 address lines and the M2 line through an OR and NAND gate which resulted in a signal which goes low (to enable the SRAM) when A15 is low, A13 and A14 are high, and M2 is high. One final note on this, when the NES disables the SRAM the same line is used to trigger an interrupt on the MC so the MC knows the SRAM has an updated value from the NES. When the the MC receives a Tweet command from the NES, it uses a TCP/IP chip to relay the Tweet to a custom server which uses the Twitter SDK to relay the Tweet to the world. Super special thanks to my brother Jered McFerron for writing the Twitter relay app on the server! I hope this was interesting to at least 1 person out there. If you have any questions or insight please contact me! The connector to the expansion port is an ISA connector cut down to 24 pins on each side and split in the middle to allow for a wider width.